If you are anything like me, you’ll always have your latest ‘bike of interest.’ To the uninitiated, that’s the bike that is currently catching your eye. The one that you look at first when you surf eBay or thumb through the local classifieds. And for me right now, the bike is definitely the BMW K100. What it is about the K that really pushes my buttons, I’m not quite sure. Maybe it’s the ludicrous car engine laying on it’s side in the frame. Maybe it’s the shaft drive, or maybe it’s just the jaw-dropping mass of the things. 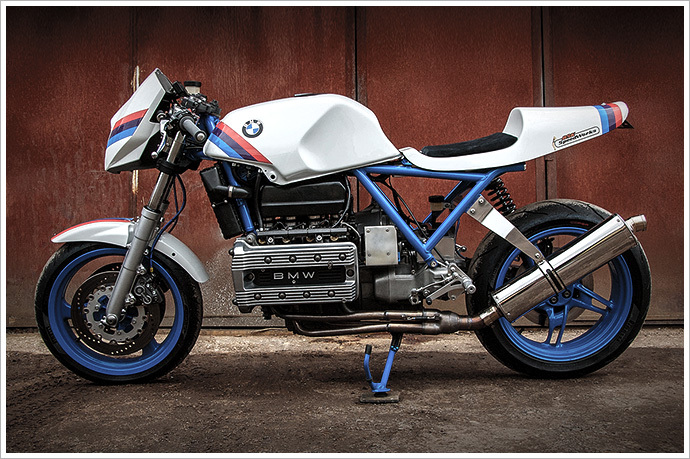 Whatever the case, if I started a new project bike today, a Beemer K100 would be it. And it’s not just me who’s thinking along these lines. Take, for instance, one Ben Kingham of BSK SpeedWorks in Bedfordshire, England. He too has the bug, and I think it’s fair to say that he been bitten worse than I have. A lot worse.